This memorial website was created in memory of our loved one, Nadezhda Popova, 91, born on December 17, 1921 and passed away on July 8, 2013. Where Nadezhda Popova is buried? 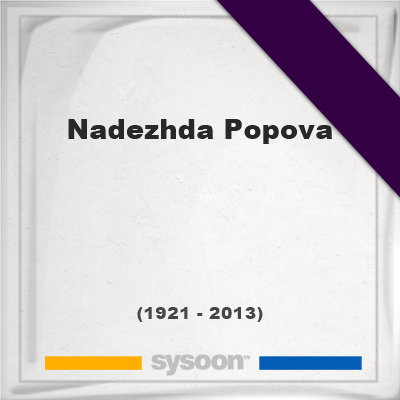 Locate the grave of Nadezhda Popova. How to find family and friends of Nadezhda Popova? What can I do for Nadezhda Popova? Nadezhda Popova as one of the first military female pilots in the Soviet Union, and was highly decorated with awards including the title "Hero of the Soviet Union", the Gold Star Medal, the Order of Lenin, and three Orders of the Red Star during the Second World War. Note: Do you have a family photo of Nadezhda Popova? Consider uploading your photo of Nadezhda Popova so that your pictures are included in Nadezhda Popova's genealogy, family trees & family history records. Sysoon enables anyone to create a free online tribute for a much loved relative or friend who has passed away. Address and location of Nadezhda Popova which have been published. Click on the address to view a map. 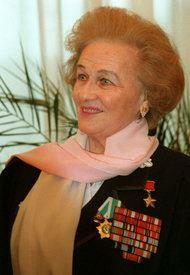 Nadezhda Popova was born in Russian Federation.